Mrs. Hudson absolutely stole the show this week. She put Sherlock in the trunk of her Aston Martin. She knew exactly what to say to John to get the boys back on speaking terms. She was such an understanding sweetheart to both Sherlock and John and she gave Mycroft a piece of her mind. Furthermore, she understands better than anyone else that Sherlock fell apart because John left him. She thinks that’s so obvious that she just laughs in Mycroft’s face for not noticing. When I grow up, I want to become Mrs. Hudson. She is not your housekeeper, and she’s certainly not a civilian. The other thing I loved about the characterization of Mary in this episode was how well she knows these boys. Both Ghost-Mary and postmortem video-Mary really understand how John works, how Sherlock works, and how their relationship works. So yeah, I was happy with Mary on the whole. But what kind of emotionally manipulative, cold-hearted woman encourages a close friend to rekindle his addiction to heavy drugs in order to facilitate someone else’s grieving process? 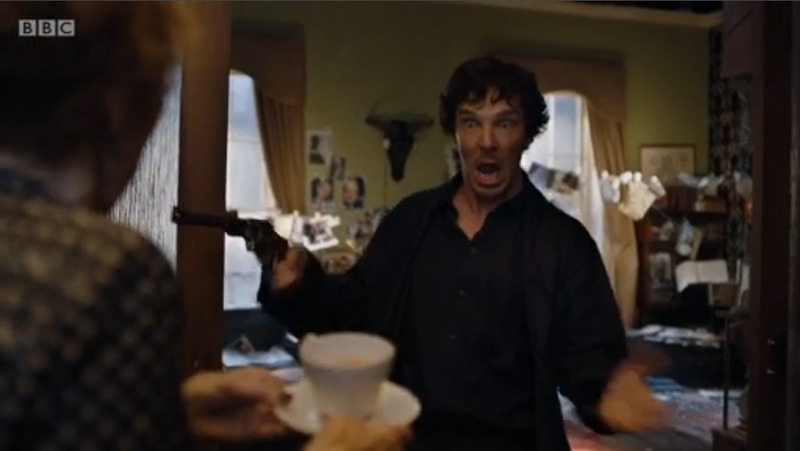 I’m not at all surprised at Sherlock’s tendency to self-destruct, especially if he can “save” John in the process. I just think it’s despicable of Mary to encourage Sherlock’s self-destruction. Now let’s have a look at the man himself. Sherlock Holmes, saving suicidal cripples since the 19th century. Of course, there’s been speculations surrounding another Holmes sibling since Mycroft talked about “the other one” in His Last Vow. The fan community, en masse, assumed that the name of this third sibling would be “Sherrinford” after Mycroft said “put me through to Sherrinford please,” last week in The Six Thatchers. That’s quite plausible, seeing as Sherrinford was originally the name of the third Holmes brother according to Arthur Conan Doyle’s notes on the matter. In The Lying Detective, when Mycroft says “Sherrinford is secure,” it sounds more like a facility than like a person. Also, how can Mycroft say that when, at that very moment, Sherlock is out in the London streets with the third sibling? This sibling, a woman, is named “Euros.” That doesn’t sound like “Sherrinford” at all. So are there four siblings? Is that why Sherlock went on about the comfort of the number three, and the human tendency to stop looking for more once three recording devices or siblings have been discovered? The name Euros, however, is an Ancient Greek word for the East Wind. Bear in mind that when Sherlock was put on a plane in His Last Vow and thought he was leaving England for good, he said: ” The east wind comes for us all in the end.” Foreshadowing much? Also, why does Mycroft say: “The man you are today is based on your memories of Euros,” in the new trailer? What the hell happened there? I was very impressed, both with Toby Jones’ acting and with the inventing scriptwriting that created this super villain. It’s a terrifying thought, that famous people, rich people, well-respected people might be serial killers. See also: Dexter. And there’s something else to consider. In the first ten minutes of the episode, Culverton Smith uses a memory-altering drug on a number of people. So how sure are we that all of this actually happened? Sherlock’s memories may have been messed with. It was a widespread theory last week that the events of The Six Thatchers had never actually taken place and that they were just Sherlock’s drug-induced delusions. However, they used drugs to make Sherlock into an unreliable narrator before in The Abominable Bride, and I don’t think they’d resort to the same explanation twice, no matter how clever. No, after that opening scene I was expecting a Memento-type narrative, and I still don’t entirely trust the facts as they were presented to us. The Detective isn’t the only one lying to us in this episode; I’m pretty sure Mofftiss are playing us as well. 1200 words into this review and I’m only now getting to my favorite bit. I’m an avid Johnlock shipper, and it probably clouds my judgement. But the gay subtext in this episode was so blatant it was basically text, and I’m hoping against hope that Sherlock’s love confession of next week might be aimed at John after all. Let me tell you why by dissecting a key scene. Let’s focus on one of the closing scenes, the one where John and Sherlock open up to each other at Baker Street. Irene texts Sherlock, and John goes berserk with jealousy. It appears that he’s jealous because Sherlock’s love interest is alive whereas his own (Mary) is dead, but is that really it? Am I the only one who remembers that Irene Adler is actually canonically gay? She wouldn’t want anything romantic or sexual from Sherlock, because she’s ATTRACTED TO WOMEN. Guys, keep your head on straight. Oh, err, keep your head on gay. Then there’s Mary’s part in the whole ordeal. In her video to Sherlock she describes John as “the man we both love,” which could be platonic enough, but actually isn’t. Would you let yourself spiral into drug addiction for someone who was just a friend? Personally, I would not. But Sherlock is willing to die because he truly believes John will be in time to save him. Goddamn. He’s so in love with John it hurts my eyes to see that much pure adoration. And then, when John and Sherlock are finally talking, John encourages Sherlock to seize the day because the people you love might be taken from you at any moment. Mary is a case in point. John thinks he’s encouraging Sherlock to intensify his contact with Irene, but Irene is not up for that. So not up for that. He encourages Sherlock to go find a person who can make his life complete, but JOHN IS THAT PERSON. John has proven to be that person to Sherlock time and again. So what is John actually saying? We know from the trailer that Sherlock tells someone he loves them in The Final Problem. I don’t think it’ll be Irene. Keep in mind that Mary in this scene is entirely made up out of John’s subconscious, and she then encourages him to “get on with it,” whatever that means. The boys hug (Sherlock cradling John’s neck, kill me now), and say: “it is what it is.” Yes boys, but what exactly is it? One other telling detail: the woman John almost cheated on Mary with, the one he saw on the bus, was in actuality Sherlock’s sister. In a sense, she was the female Sherlock. I have no problem believing that John has issues with being attracted to men, but none whatsoever with being attracted to women. And he is attracted to Sherlock’s sister. Freud would have a field day. Please never ever have your hands tremble in my presence again. Because I will say: “Are you having an earthquake?” Because that will never stop being hilarious. Also, I might drink some water from your vase…. Tune in on Frenzied Fangirl same time next week to read my thoughts on The Final Problem. But, you know, not actually to read my thoughts because that would freak me out. PS: Mycroft / Lady Smallwood, is that a thing? Isn’t Mycroft gay? PPS: I won’t even dignify this episode’s cliffhanger with an analysis because the trailer for The Final Problem already shows us its outcome.